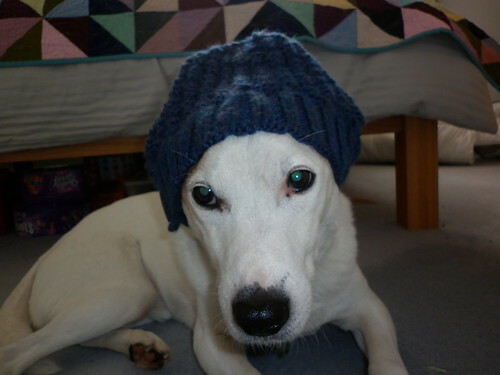 Archie the wonder dog: March already...how did that happen?! Glad to see that ol' dragon ME, hasnt stunted your humour neurones, Helen. Poor Archie... you do tease him. Oh, and beautiful butterflies, perfect logs etc etc.... **hugs** for a way better month. You managed to make a lot in February! I love the butterflies. They are just gorgeous and the embroidery is so lovely! ♫ Happy Birthday to you, Archie ♫ You sweet little puppy dog, sending you hugs and kisses and lots of love. Why did you do it!?? Make that handsome dog Archie look like Compo? hehe! All your makes are gorgeous particularly J's butterfly blocks - she is going to have an awesome quilt! Excited about your garden even in this state it looks better than my soggy trenches! Hope you get more energy to stitch in March! It's always wonderful to hear from you and Archie. 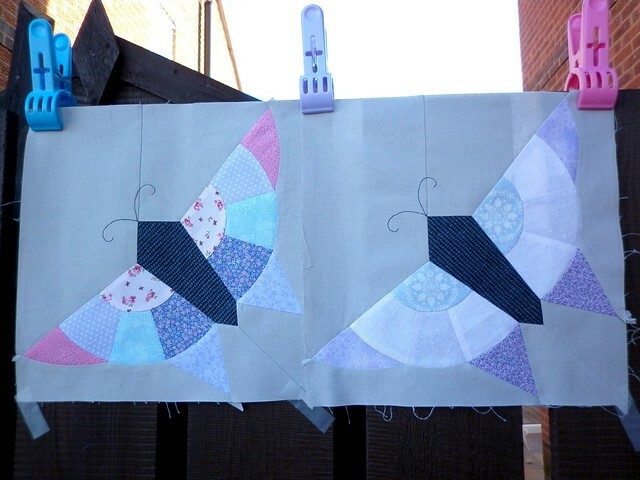 The butterfly blocks are really lovely. I've been thinking about log cabins as our next guild swap. I'm with Salley - poor Archie! ;-) Love the cave and all the other photos. I would love a low maintenance garden. I do not have a green thumb, or any of my other digits for that matter. The butterflies are super cute though. Happy Birthday Archie! You don't look like 14. So great to hear from you again! 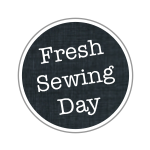 You have made beautiful sewing Works and gardening is fun too. Hugs from Nero! wow, 14! Bix Cat will be 18 in April - our furry friends are now elder statesmen, no wonder they get distinguished hats! Your butterfly block sounds amazing, though almost certainly way too difficult for moi! I lost you for a while, glad I found you again. First of all happy B-day to Archie. 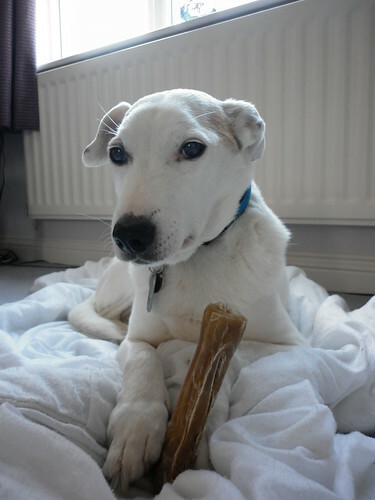 He looks quite happy with his big bone. I absolutely adore the cave he left behind. So Archie-ish! Apparently this "Bee a brit stingy" is lots of fun. You have been sharing the most wonderful works! Wow! You've been busy! 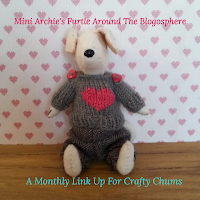 Great to find your blog, you have a new follower! The butterflies are stunning. Have to try that one. You can "waffle away" any time and I'll love reading it. Happy Birthday Archie! Really love your photos of Archie's tent and hat. Beautiful butterfly blocks!! I know your yard will be great and you can enjoy working in it. We have a smallish yard and I like pottering. Herschel says hi! Happy Birthday Archie! Our dog always gets presents too for birthdays and Christmas, after all he is family. 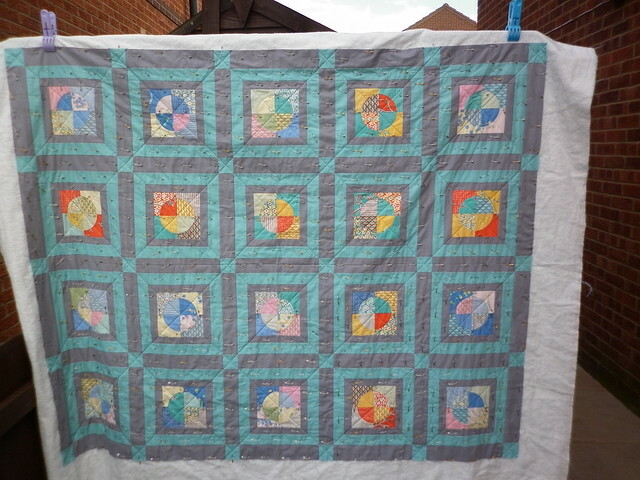 I really like your quilt, it will be a work of art when all finished and bound. What a clever idea to adapt the blocks so you can hand sew them! Many happy returns to the lovely Archie. One of my dogs likes to sleep in a nest, I wonder if it's a white dog thing? Loving all your Bee blocks, especially the butterflies. Happy birthday to Archie and looking forward to seeing your newly transformed garden ( when the rain stops). 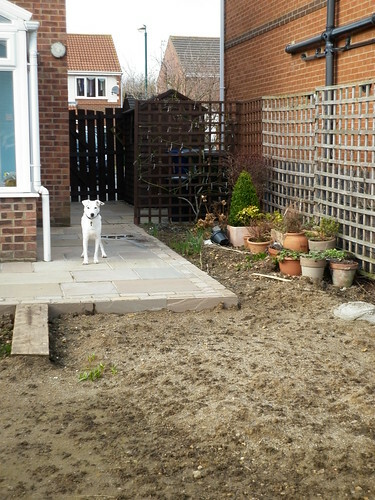 I can't wait to see your new garden! lovely butterflies! 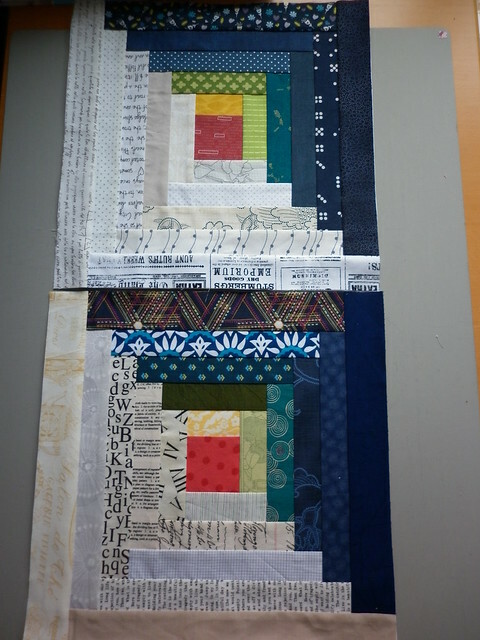 I'm still working on Emily's blocks - I cut what I thought was enough fabric and took them away with me for the weekend. Of course, I ran out of strips with a couple of rounds to go. I always totally underestimate how much log cabins need! I'm an idiot! Everything is lovely, including Archie's new hat. How adorable! 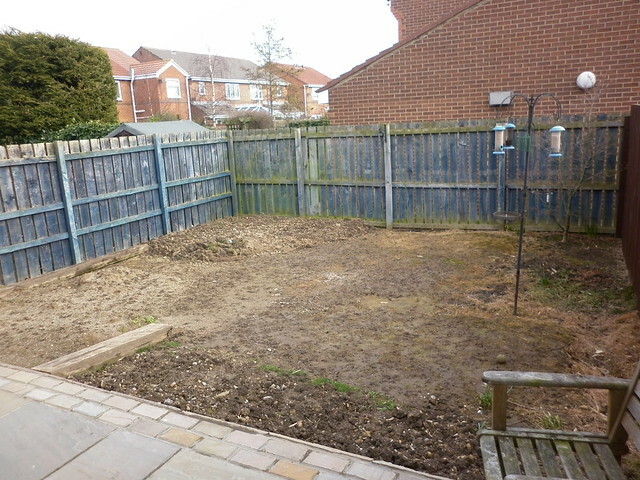 You sure have been busy with lots of things- I just love a vacant garden, as it lets me think of possibilities! The needlepoint (sewing machine?) is sure to be great, and the coloring of the log cabin blocks is terrific. Keep it up, though I'm not sure how you find all those hours in a day. Lovely quilty things! I know how hard it is to find the energy to do stuff, but it's brilliant that you are keeping going and managing to finish some projects - it doesn't matter if it takes us longer than other people, we still get the same sense of achievement (or even more!) than those not cursed with ME. Hang in there - and good luck with the garden re-design! Beautiful, beautiful work :-) I'm so glad that you're enjoying the Bee. Happy birthday Archie! Your hand embroidery is lovely. I loved the cave left by Archie . Happy birthday to Archie . Ugh, aida. Glad you discovered evenweave. 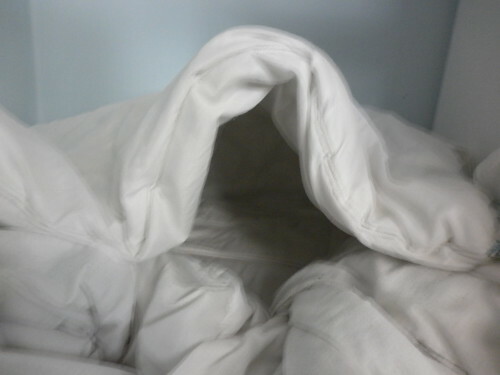 Linen is fun too. This piece is taking shape nicely. Looks like the beginnings of a little sewing machine to me. 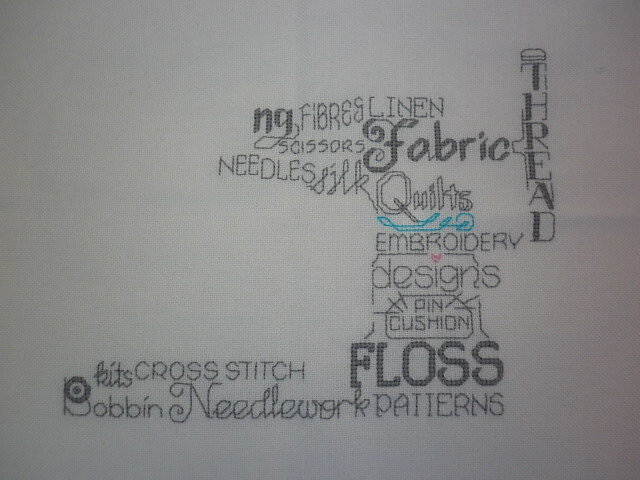 Although, not all of the words match a sewing machine. Glad you're able to hand sew some of your blocks. And they're looking good. So do you always pin baste? What are your thoughts on pin vs sewn (lines) basting for hand quilting? I missed the post too, glad I am here :). Love your post and the place of Archie under the blanket ;-). Thanks for caring for me and my mum!